Designed for the extreme high performance street or all out race car, this transmission will give you consistent shifts as well as complete control over shift points. 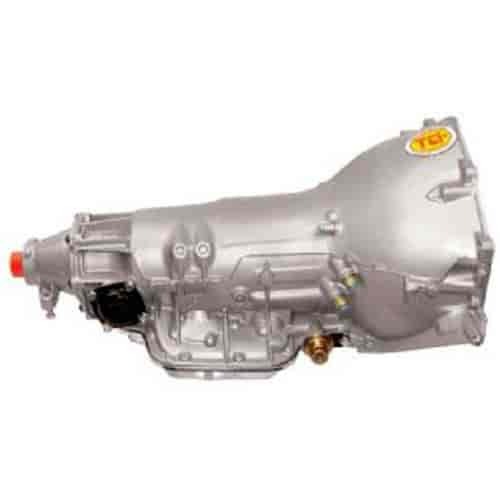 This drag race transmission offers a reverse shift pattern and requires no vacuum hookups or kickdown linkage. This means there are no external linkages to be purchased, which saves some expense. The increased line pressure provides a harder, quicker shift and eliminates the lag time between shifts produced by automatic shift transmissions. Extreme performance clutches and nitrided steel plates for enhanced performance. High-performance power bands provide greater torque capacity and more positive shifts and band apply. Hardened sprag races increases durability & strength. Improved lubrication system increases fluid sent to planetaries and internals. Able to handle up to 750 HP, depending on application. Note: Competition transmission speedometer cable provisions are shipped sealed with a freeze plug. Removal of the freeze plug is required for speedometer cable housing installation. Does TCI 212000 fit your vehicle? What horsepower rating is this? What is the spline count for the output shaft? Able to handle up to 750 HP, depending on application. 32 spline output shaft.